Understanding disparities in school readiness among America’s children when they begin kindergarten is critically important, now more than ever. In today’s 21st century global economy, we expect the great majority of our children to complete high school ready to enter college or begin a career, and assume their civic responsibilities. This requires strong math, reading, science, and other cognitive skills, as well as the abilities to work well and communicate effectively with others, solve problems creatively, and see tasks to completion. Unfortunately, the weak early starts that many of our children are getting make it hard to attain these societal goals. Since key foundations for learning are established beginning at birth, starting school behind makes it likely that early disadvantages will persist as children progress through school, and last into their adult lives. Knowing which groups of children tend to start school behind, how far behind they are, and what factors contribute to their lag, can help us develop policies to avert the early gaps that become long-term problems. Inequalities at the Starting Gate: Cognitive and Noncognitive Skills Gaps between 2010–2011 Kindergarten Classmates explores gaps by social class and race/ethnicity in both cognitive skills—math, reading, and executive function—and noncognitive skills such as self-control, approaches to learning, and interactions with teachers and peers. We refer to these skills gaps as gaps in school readiness. The gaps reported in Inequalities at the Starting Gate are presented as a group’s score on a given skill relative to a comparison group. (Skills are measured in standard deviations—a metric commonly used in education research—with a mean of 0 and a standard deviation of 1. This allows for measuring how far a group’s average score is from the comparison group’s average score and report it as a fraction of one.) For more information on the methodology, sources (the U.S. Department of Education’s National Center for Education Statistics and others), and findings, please visit epi.org to review the full report: Inequalities at the Starting Gate: Cognitive and Noncognitive Skills Gaps between 2010–2011 Kindergarten Classmates, by Emma García, Economic Policy Institute, June 17, 2015. The paper uses data from the National Center for Education Statistics’ Early Childhood Longitudinal Study, Kindergarten Class, a cohort of students who entered kindergarten in 2010 for the 2010–2011 school year (ECLS-K 2010–2011). 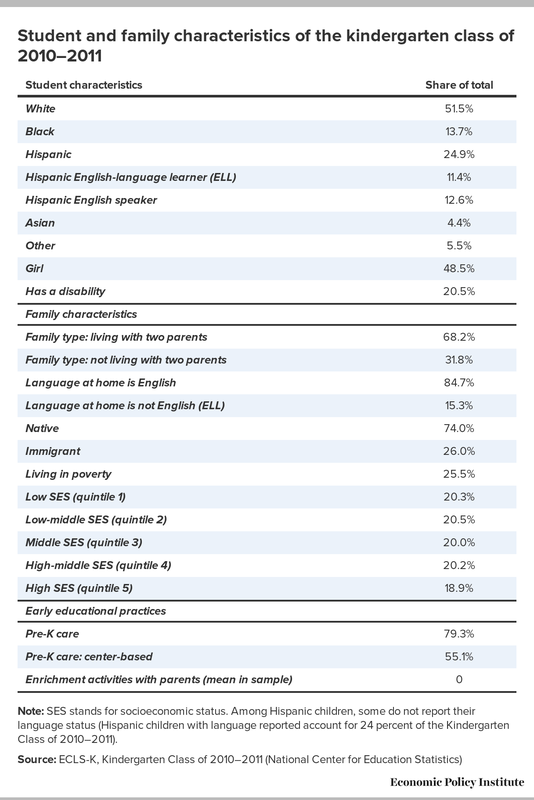 The nationally representative sample provides information about the children—their race or ethnicity, socioeconomic status, language spoken at home, etc.—and their experiences in their early years, such as how actively their parents engaged them in enriching activities and whether they received prekindergarten care (see table at right). The analyses focus on the association between these characteristics and children’s readiness for school. Note: SES stands for socioeconomic status. Among Hispanic children, some do not report their language status (Hispanic children with language reported account for 24 percent of the Kindergarten Class of 2010–2011). The findings reflect broader societal inequities. As is true of odds of school and life success among Americans today, social class is the single factor with the most influence on how ready to learn a child is when she first walks through the school’s kindergarten door. Low social class puts children far behind from the start. Race and ethnicity compound that disadvantage, largely due to factors also related to social class. A substantial minority are so far behind that school success will be very hard. Given the large share of children entering our schools from disadvantaged contexts, these findings demand our urgent attention on both economic and moral grounds. Research has established that growing up in poverty tends to put children behind. Inequalities at the Starting Gate seeks to determine how much social class matters, both absolutely and relative to other factors, such as race and ethnicity. It also assesses how a range of family characteristics and parenting practices, such as family composition, paid care, and enriching activities with parents, influence education gaps between groups of young children. To understand the influence of social class—parents’ income levels, level of education, and job status—on children’s early development, the study divides children into five groups based on social class and compares the second (low-middle), third (middle), fourth (middle-high), and fifth (high) quintiles or “fifths” with the first (low) fifth. We use the term social class to refer to the socioeconomic status (SES) construct created for the ECLS-K by the U.S. Department of Education’s National Center for Education Statistics based on five different components, including parents’ (or guardians’) educational attainment, occupational prestige score, and household income. Children in the highest socioeconomic group (the high SES fifth) have reading and math scores that are significantly higher—by a full standard deviation—than scores of their peers in the lowest socioeconomic group. Reading and math skills advantages of children in the middle of the SES distribution relative to the lowest SES group are roughly half as large as advantages of high-SES children to the lowest SES group. Considering race in addition to social class reduces math and reading skills gaps minimally. And even adding in controls for the full range of parental and care activities shrinks these gaps only slightly more (to 0.8 standard deviations). There are significant gaps between the reading and math skills of both white and Asian children and the reading and math skills of black and Hispanic children. However, these gaps are much smaller than gaps based on social class. Race-based skills gaps shrink significantly when children’s social class is taken into account. This, too, affirms prior research, which finds that racial minorities’ lower socioeconomic status largely explains gaps that appear to be due to race. Adding controls for social class and a set of parenting characteristics and practices makes the gap in reading between black and white children disappear almost entirely and the reading gap between non-English speaking Hispanic children and their white counterparts shrink by more than two-thirds. That such characteristics do little to mitigate the influence of social class (shrinking SES gaps only slightly), but substantially reduce the influence of race on gaps suggests an association between these characteristics and socioeconomic status. In other words, black parents may read to their children less often not because of their race, but because they are less likely to have a second parent to help out. In real life we cannot disentangle black and Hispanic children’s race and ethnicity from the contexts in which they live, which put them at a major disadvantage relative to their average white and Asian peers. It is not race itself, then, but the poverty and other things that too often go along with being a minority child in America, that compound disadvantage. In addition to the high odds of living in poverty (as do 46 percent of black and 63 percent of non-English speaking Hispanic children), these disadvantages include living with one parent (as do 65 percent of black children), and lacking access to preschool (as do 53 percent of Hispanic children, compared with only 40 percent of white children and less than 40 percent of Asian children). When assessing students’ readiness to enter school, it is increasingly apparent that researchers need to focus on a much broader set of skills than math and reading. Persistence is as likely as math and reading aptitude to help a student actually finish high school. Effective communication with teachers and peers is also critical to school success, as is the ability to play well with others. These so-called noncognitive skills tend to develop—or lag—in tandem with cognitive skills. Noncognitive skills are harder to measure than cognitive skills because they are harder to define and lack reliable “tests.” Despite these measurement challenges, since they interact with cognitive skills and are key to every child’s full development, it is critically important to understand the gaps in these noncognitive skills. The Early Childhood Longitudinal Study asks both parents and teachers to rate children’s abilities across a range of these skills. Of course, the specific skills measured may vary between the home and classroom setting; creativity, for example, could look different when constructing a tower of blocks at home versus writing an essay in class. Expectations may also vary by context. Teachers likely evaluate their students’ skills levels relative to those of other children they teach. Parents, on the other hand, may be basing their expectations on family, community, culture, or other factors. Nonetheless, all adults report gaps by social class. The most socioeconomically disadvantaged children lag substantially in noncognitive skills, as rated by both parents and teachers, although the gaps are not as large as those in reading and math. For example, social class–based gaps in self-control and approaches to learning, as reported by teachers, are roughly half as large as gaps in math and reading; as reported by parents, SES-based gaps in these noncognitive skills are between a third and a half as large as gaps in math and reading. Both parents and teachers also perceive social class–based gaps in students’ social skills, with the high-SES students enjoying even larger advantages when reported by teachers. Both groups of adults note gaps in persistence between low- and high-SES students. Again, teachers see larger gaps than do parents. Both Asian and non-English speaking Hispanic parents give their children low scores on approaches to learning compared with how white parents score their kids. On the other hand, teachers perceive no advantage for white students. There is a visible gap between parents’ and teachers’ assessments of black children. Black and white parents equally rate their children’s persistence, approaches to learning, and social interactions, but when teachers do the rating, black students have a distinct disadvantage relative to whites in these skills. The disparity with respect to self-control is even more visible than differences in persistence, learning approaches, and social skills. According to parents, black children exhibit a relatively high degree of self-control, while teachers perceive black children to have substantially less self-control than white students. The fact that parents’ and teachers’ assessments match when broken down by social class, but not by race, suggests that race introduces some biases—whether on the part of parents or teachers—that we must seek to better understand. The findings of Inequalities at the Starting Gate study affirm decades of research that connects parents’ economic resources and opportunities with their children’s school readiness. When those resources are limited, children aren’t prepared, cognitively or noncognitively. When those resources are evident, children are well prepared. These unequal starts by race, ethnicity, and, most stubborn of all, social class, emphasize the urgent need to rethink how we design and implement not only our education policies but also our social and economic policies. Home visits by nurses that help parents understand and ensure their children’s healthy development improve child well-being and school readiness. Congress has reauthorized federal funding for the Maternal Infant and Early Child Home Visiting program, which supports state home-visiting programs. However, many at-risk mothers are not being served. Quality child care helps ensure that children go to school ready to learn (and that parents have a stable place in the workforce). The recent reauthorization of the Child Care and Development Block Grant Act (CCDBG) was an important step toward improving the safety and quality of child care for children whose parents need federal subsidies. However, funding is so limited that even many eligible families cannot receive the support they need. Prekindergarten boosts children’s odds of thriving in kindergarten and after, with the biggest benefits for low-income children. While states have made real progress toward making pre-K available to low-income children, quality remains very uneven, and as the data show, some of the children who would benefit most—such as non English-speaking Hispanic children—still lack access to such programs. Given the societal returns from these programs, policymakers at all levels should ensure the needed public investments to expand them in states with strong programs and establish quality programs in other states. Raise wages, starting with the federal minimum wage. Many states and cities have already raised the minimum earned by the lowest-wage workers and it is time for Congress to follow. One current proposal would raise the minimum wage, which is lower in real terms than it was in 1968, to $12 an hour. Policymakers could also make those wages go further by increasing the earned income tax credit. Boost employment. Low-SES families are particularly vulnerable in times of high unemployment, as the recent slow recovery from the recession of 2007–2009 has shown. The federal government has a range of jobs-boosting policies at its disposal, including interest rate policies of the Federal Reserve and investments in infrastructure, in addition to initiatives to connect unemployed workers with existing jobs. Sustain the social safety net. As many studies have shown, unemployment insurance, food stamps, cash assistance, and other federal programs that help families navigate tough economic times help ensure that children do not suffer the effects of poverty. These programs must be sustained and extended to all families that need them, especially those with vulnerable children. Reform corrections policies. Other structural factors influence a child’s odds of growing up poor. For example, millions of American children are growing up in single-parent households (or with no parent) because one or both parents are in jail. While there are many barriers to growing up in a two-parent family, smart reforms to corrections policies, which research shows would also benefit states economically, would address one major obstacle. Enact immigration reform. Hispanic children growing up in immigrant households may face additional roadblocks to success. Lack of legal status severely limits many parents’ work options and can destabilize families, which obviously affects children’s well-being. In this way, immigration reform discussions are relevant, too, to school improvement efforts. Address segregation and concentrated poverty. Finally, we must address societal and structural biases that compound the effects of poverty for children of color. Black and non-English speaking Hispanic children tend to grow up in isolated neighborhoods of concentrated poverty, and many black children live in those conditions over multiple generations. Decades of research suggests that poor children growing up in segregated minority communities are more likely to remain in poverty because they have less access to good schools and social capital and other resources. Thus reducing segregation and multigenerational poverty through fair and affordable housing policies is an additional imperative if we are to improve education. The education gaps highlighted in Inequalities at the Starting Gate sometimes narrow as children grow. But they nevertheless represent bleak life prospects that portend serious problems for our society as a whole. If we do not treat them as both the moral and economic crisis they represent, we waste the human capital contributions of groups that have shaped our country’s uniquely diverse, dynamic, and entrepreneurial nature. We share a national ideal that everyone should have the opportunity for prosperity and success. Reclaiming this vision for our children begins with ensuring that all children start school on equal footing.